It was St. Thomas, I think, who pointed out a long time ago that if God wanted to get rid of the universe, He would not have to do anything; He would have to stop doing something. Wine is — the fruit of the vine stands in act, outside of nothing — because it is His very present pleasure to have it so. The creative act is contemporary, intimate, and immediate to each part, parcel and period of the world. …The bloom of yeast lies upon the grapeskins year after year because He likes it; C6H12O6=2C2H5OH+CO2 is a dependable process because, every September, He says, That was nice; do it again. Let us pause and drink to that. 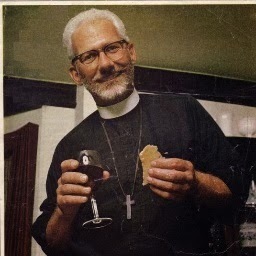 And as for what he calls The Woman’s Christian Temperance Union’s version of The Lord’s Supper, only about 100 years old and lacking completely what Holy Scripture and church tradition prescribe as the proper drink, he does not shrink back from engaging its adherents in argument, particularly the ones who think that the Greek word for wine in the Gospels meant something other than wine. The commentator cited, as I recall, grape juice for one meaning, and raisin paste for another. He inclined, ultimately, toward the latter. I suppose such people are blessed with reverent minds which prevent them from drawing irreverent conclusions. I myself, however, could never resist the temptation to read raisin paste for wine in the story of the Miracle of Cana. “When the ruler of the feast had tasted the water that was made raisin paste…he said unto the bridegroom, ‘Every man at the beginning doth set forth good raisin paste, and when men have well drunk [eaten? — the text is no doubt corrupt], then that which is worse: but thou hast kept the good raisin paste until now. '” Does it not whet your appetite for the critical opera omnia of such an author, where he will freely have at the length and breadth of Scripture? Can you not see his promised land flowing with peanut butter and jelly; his apocalypse, in which the great whore Babylon is given the cup of the ginger ale of the fierceness of the wrath of God? With wine at hand, the good man concerns himself, not with getting drunk, but with drinking in all the natural delectabilities of wine: taste, color, bouquet; its manifold graces; the way it complements food and enhances conversation; and its sovereign power to turn evenings into occasions, to lift eating beyond nourishment to conviviality, and to bring the race, for a few hours at least, to that happy state where men are wise and women beautiful, and even one’s children begin to look promising. I admit I am inspired by RFC’s eager receptivity to God’s gifts. What little appreciation I’ve had for wine as a beverage has been slow in developing, and I let my husband be in charge of that aspect of our dining. But wine in the chalice of Holy Communion has always seemed to me the obvious choice in obedience to Christ’s teaching. This chapter contains more and expanded theologizing about the secular and the sacred, using wine and the making of wine as a demonstration of the goodness and delight of God. I am still musing on much of this and hope to ramble on here again, sharing with you the infectious loves of Robert Farrar Capon. RFC is the man we need. RFC begins with the meat. RFC considers blood and sacrifice. RFC makes one of nature’s marvels. This is a wonderful read….once again. Thank you so much for sharing. I have to say that I will be interested as I just heard someone talk on just this subject with this same conclusion just yesterday. I always enjoy seeing what you are thinking about. Iron does sharpen iron. It's not alcohol that's the sin, it's being drunk. Gretchen, I was raised in a tee-totaling family and even my parents have come round, lo these many years later. They recognized that moderation in all things is the key…and that includes alcohol. Lisa, I didn't take it as a rant. In your situation it seems to me that not drinking might be offered up as a prayer. Great passages! Thank you for distilling your encounter with this author. I'm so enjoying your posts on Mr. Capon. His writing style is lively and engaging. I love his quotes here – esp. the first one! We don't use wine at our church, but only b/c Adam would not be able to get the older members/elders to do so. But the practice is, thankfully, returning to many churches. I like the distinction he makes b/t wine and hard liquors. I wish I enjoyed wine's taste; I do not. I continue to work on it, with little progress. It must be a flaw in me that God will correct in the next life. Oh, GJ, in eternity, you and I will get to sit, sip wine, and look at flowers together to our hearts' content!